When looking at solar thermal, pool owners are perhaps the most knowledgeable about the benefits and cost savings of using solar to heat their pools. Most pools are seasonal and as such are only used during the summer seasons. 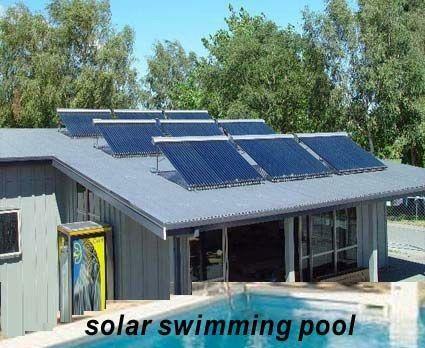 However the investment in solar can be a great benefit for solar pool owners. 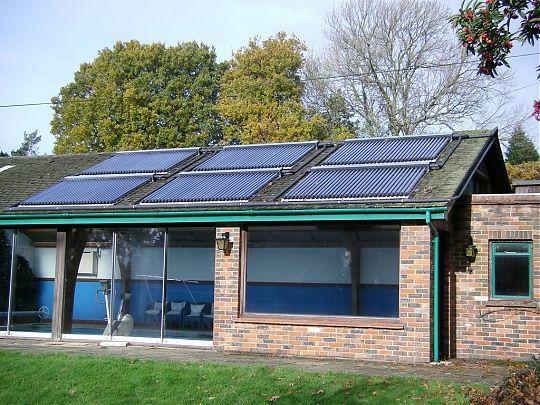 In fact our systems can be integrated so that in the summer time they supply heat to the pool and in the winter time they provide home and space heating as well as domestic hot water. This means solar pool heating systems can reduce your heating bills year round! Our systems are also the only choice for indoor pool owners looking for a solution to heat their pool during the winter. Our Pool heating systems have a much longer life expectancy and deliver more heat energy through the season than any other type of solar pool heater. 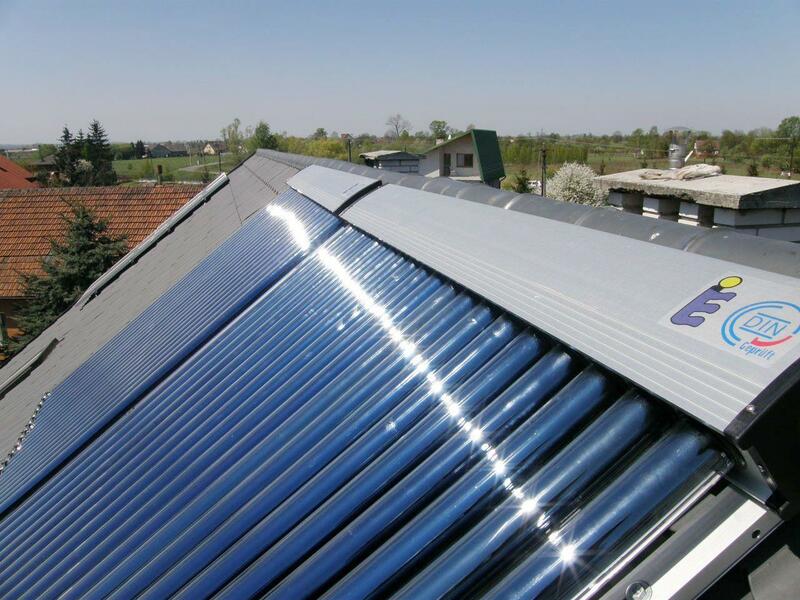 As such the overall cost of ownership is substantially less to the home owner yielding huge savings over fossil fuels and electricity, as well as larger savings versus other types of traditional solar pool heating methods. Gone are the days of leaky plastic mats that line the roofs of pool owner’s homes! 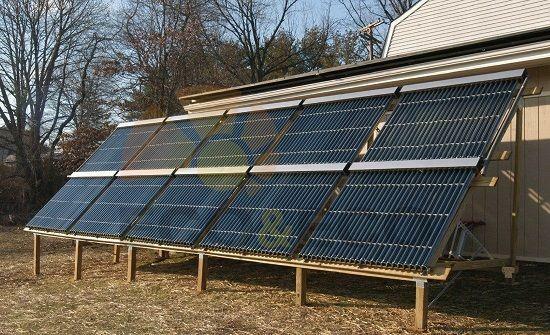 Welcome to the new age of solar pool heating using hi-powered solar vacuum tubes to provide solar heating energy that is delivered indirectly to the pool. By using a stainless steel or titanium heat exchanger we can eliminate the harmful damage that chlorinated water can have on any solar heating system. The use of a heat exchanger removes the need for oversized pumps to raise the large volumes of water to the top of a roof. Instead all that is needed is a small circulating pump that draws less than a light bulb with life expectancy of 20 years. 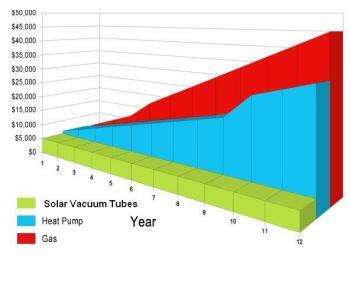 The advantages of Solar Evacuated tubes are numerous for heating a pool. To begin with a vacuum tube works in indirect light and in cloudy conditions, this means from sunrise to sunset and cloudy days you are still delivering useable heat energy to the pool. Vacuum tubes have a life expectancy of 25 plus years so you are not having to fix leaks and replace mats every 3-5 years. The overall cost of ownership is substantially lower. Evacuated tubes are not effected by windy conditions. Normal plastic pool heaters act like radiators removing the heat energy faster than it can be supplied whenever there is even a slight breeze. Finally vacuum tubes work even in -40. So even when the ambient temperature is colder than the pool water, your solar pool heating system is working. Other systems only provide heat when the air temperature is greater than the pool temperature. This means a pool owner can extend their pool season by 2-3 months by using our advanced solar pool heaters. Unlike all other pool heaters on the market, our solar pool heaters use a closed loop system. Others use an open loop system. This means that the pool pump is responsible for pushing the pool water up against gravity causing excessive wear on the pump and increasing the pumps operating cost by up to 30%. 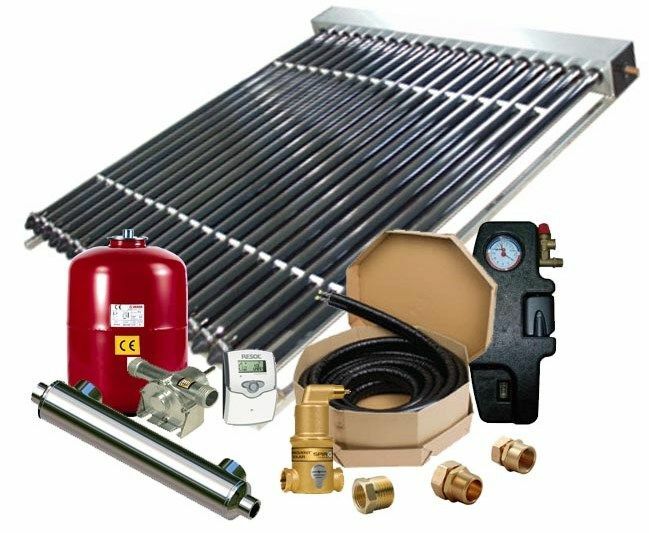 Our solar pool heaters separate the heating fluid and the pool water via a heat exchanger, a small amount of water or glycol (in freezing climates) is circulated through the solar vacuum tubes at a rate of .75-1.25 GPM. They absorb the suns energy through the advanced evacuated tube and then transfer the energy to the pool through a heat exchanger. 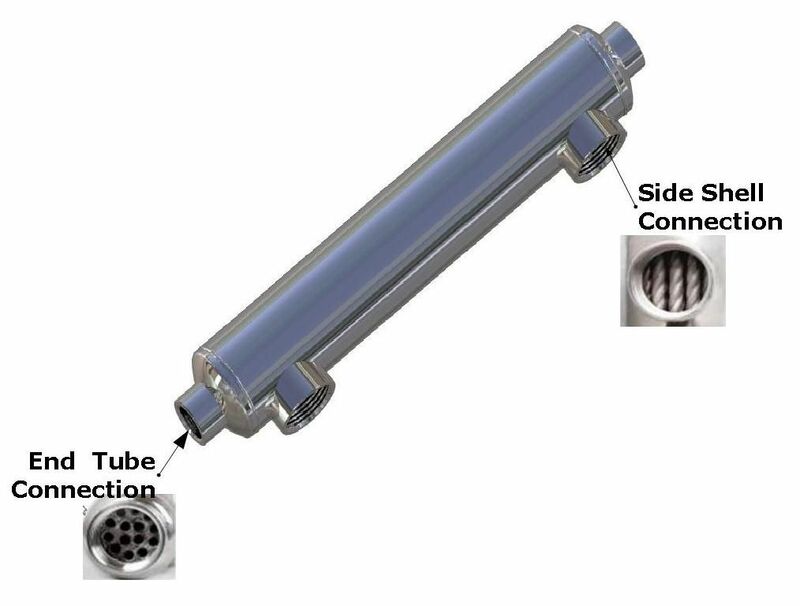 The hi-flow pool heat exchanger puts very little resistance on the pump allow it to work at its normal capacity. The chlorinated pool water never actually comes in contact with any portion of the solar heating system which extends the life and your investment by up to 5 times that of a regular pool heater. Our advanced solar pool heaters are so efficient they can start to turn on delivery heat as soon as the sun rises in the morning. No need for direct sunlight, in fact even in light rain you will find your solar pool heater is delivery heat energy to the pool. The digital controller maximizes the solar output and includes safety features such as freeze protection, holiday cooling mode and even has advanced energy monitoring that will tell you your daily savings. Our system can transmit the data to the internet giving you real time performance and historical data on any pc or smart phone via the Free Resol VBus.net. The heat transfer between the pool takes place in a highly efficient heat exchanger. For salt water pool or high chlorine levels we recommend upgrading to titanium as it will last much longer and is not effected by the chemicals present in a pool. Unlike plate heat exchangers our solar heat exchangers are designed specifically for the application of pool flow rates that can be as high as 50 GPM. The large unrestricted flow on the pool side absorbs the hot thermal energy supplied by the solar side. The two liquids do not physically contact each other. Perhaps the best advantage of our solar pool heaters is the design aspect that allows all our systems to easily integrate with each other. Your solar pool heater can also supply you with domestic hot water, it can work in the winter to supply your home with space heat or share its heat with a hot tub to maximize your investment. All our systems come standard with a second zone option that can be added at any time. Imagine heating your pool in the summer and the rest of the year having the system reduce your home heating bill by supplying you with thermal energy even in the middle of winter! Looking for another way to heat your pool? Visit our Sister company at TimberLine Wood Water Stoves for unique wood fired pool heaters that use no electricity and require not pumps! These wood fired pool heaters are great for off grid applications or to assist you with heating your hot tub or spa. 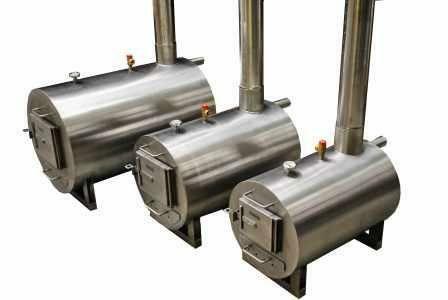 They use a principle called thermosiphon where by water is heated up in the stainless steel double walled water jacket. The hot water rises to the top and out a port into the pool. Meanwhile cold water is sucked in through the bottom of the tub to be reheated. Simple, quiet, cost effective! These heaters can also be used with an existing pump system and can heat up to 100,000 BTU/hr. *NOTE Pools larger than this should use multiple pool heaters a 1000ft2 pool should use 2 x SPH-5 systems in parallel. Sizes are approxamate, geographical location and the use of a pool cover will effect sizing. SunRain Pump Station and ReSol Differential Controller are used for our solar pool heating systems, SunRain is the world's largest manufacturer of solar vacuum tube systems, and ReSol has been the leader in solar controls for the last 20 Years with over 2 million units in service world wide. The SunRain Pump stations is a complete pump and fill system for the closed loop side of our solar pool heating systems. 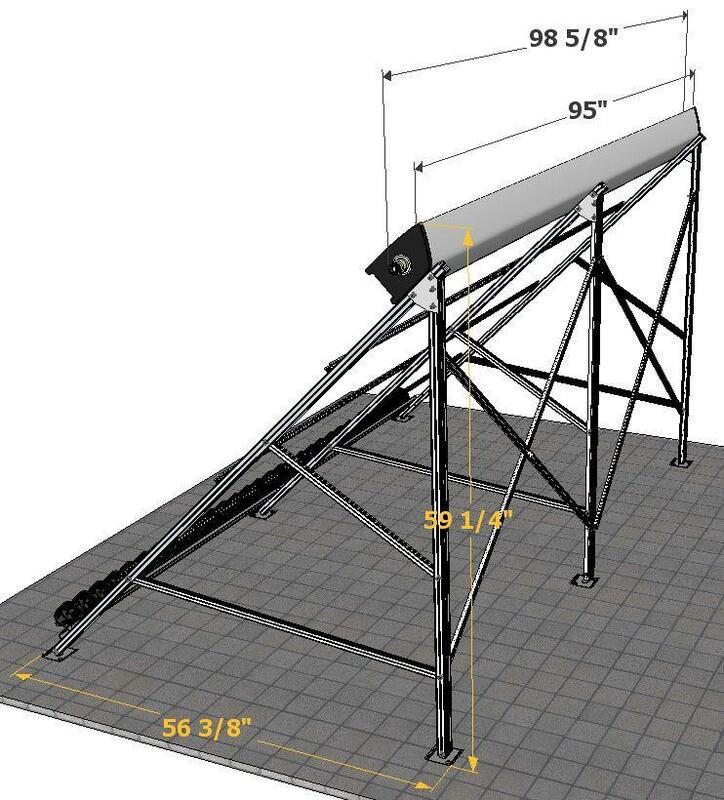 It includes all the mechanical components to quickly commission a solar heating loop such as a Wilo Star15 energy efficient solar pump with 3-selectable speeds. 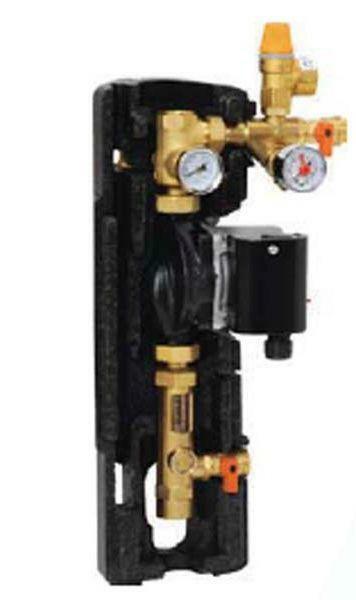 A fill and drain hose connection for quickly pressurizing the system, a glass flow meter for setting the system flow rate, a manual temperature and pressure gauge for setting the working pressure, as well as a pressure safety release valve for added safety. The SunRain Pump station is 100% brass and comes in a fully insulated casing. It is available in both 110 VAC and 220 VAC options. The ReSol DeltaSol AL solar differencial controller has all the features needed to maximize your return on your solar pool heating system. This controller comes with 2 Pt1000 high temperature sensors with the option for a 3rd reference sensor. The system has a quick graphic display and an integrated VBus connection that connect to a DL2 data logger to provide real time and historical performance to any PC or smart phone. The ReSol Controller directly connects to the SunRain Pump station turning the solar pump on/off based on the solar collector temperature relative to the pool. Advanced features such as collector cooling, pool/tank cooling during the evening and freeze protection are all built into the AL controller. Simple solar controller with extra convenience! 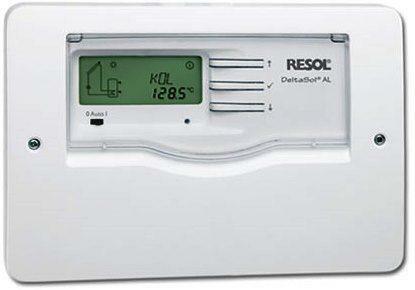 Solar controller for standard solar thermal systems! 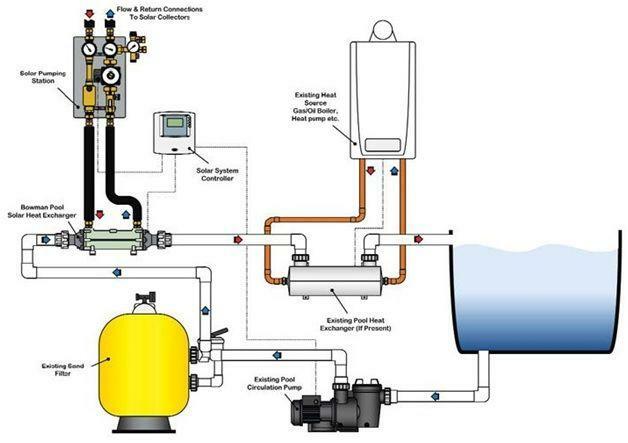 If the collectors are warmer than the pool water by 4 degrees F or more, and the pool is below the selected desired temperature, the pump will be activated allowing heat collection fro the collectors to the solar pool heat exchanger. The heat collection stops when the solar sensor temperature falls to within I.5 degrees F of the pool temperature or the pool temperature exceeds the selected desired temperature. Automatic Cooling (Field selectable option) If the collectors are cooler than the pool water by 8 degrees F or more, and the pool is above the desired temperature, the valve rotates allowing cooling via the solar collectors. The heat dissipation continues until the collectors rise to within 3 degrees F of the pool temperature or the pool temperature is lowered below the desired temperature. Single Setting For Desired Temperature The Aqua Solar is set by a single dial adjustment with the desired pool temperature clearly indicated. The dial is calibrated with the temperatures from 70 degrees F to a high of 104 degrees F for quick and easy, user-friendly operation. The temperature set indicates the desired pool temperature. The Aqua Solar will automatically determine if the water should be heated or cooled, thus maximizing the solar system capabilities. Terminal Strip Connections for input power, and sensor inputs. Controls also have industry standard 3 pin connectors for both forward and reverse valve actuator operation. LED Display show the status of the entire system operation. 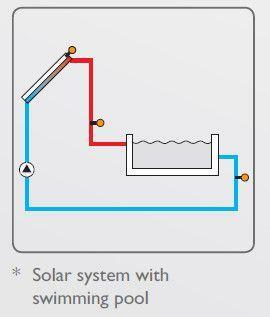 Optional Valve Output on the Aqua Solar allow for a second zone of either a pump or a 3 way valve. Re-circulation Freeze Protection (field selectable option) turns the Aqua Solar output ON, directing warmer pool water through the collectors when near freezing temperatures are noted at the auxiliary sensor. The Aqua Solar allows re-circulation when the aux. sensor falls below 34 degrees F and will stop circulation when the temperature rises to greater than 36 degrees F. Two 10K Ohm sensors are required for operation. One or more freeze snap switch sensors are also recommended if freeze re-circulation protection is utilized. Important-See instructions before using freeze re-circulation. System Operation and Test Switch allows the user to manually override the automatic function of the Aqua Solar to verify the operation.